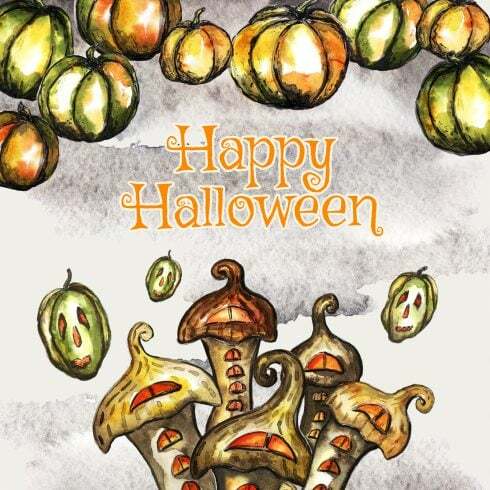 We are pleased to present you Merry Halloween – watercolor and ink hand painted collection. 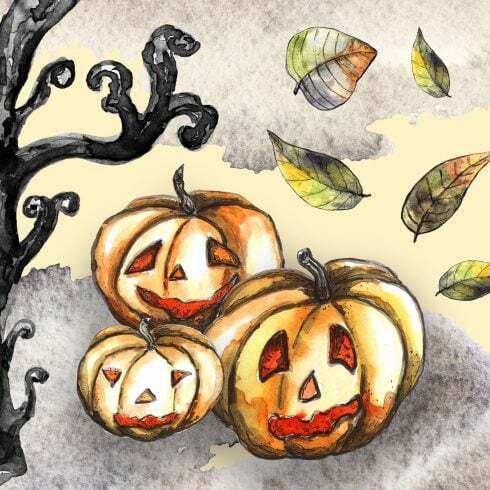 In this set you will meet sweet and horrible ghosts, leaves pulled by sadness and decay, smiling pumpkins and pumpkins without faces, old crooked trees covering ancient tombstones, towers of mysterious castle crouching with horror and more. All the elements are supplied in raster PNG, 300 dpi format. PNG files can be opened with most photo editing software, but for designing Adobe Photoshop is required.Cards are supplied in raster JPG and PSD formats, 300 DPI. For opening PSD files Adobe Photoshop CS6 is required. Each and every designer, as an experienced specialist, absolutely can draw anything from scratch. It can be unproductive, takes too much time. That is why most of the designers make use of ready-made graphics elements – combine them, customize them and construct the design with them. It is actually silly to buy all those parts separately, that’s precisely why they are put into graphic bundles and marketed as a single product. The assortments of elements compiled into a graphics package are often sorted based on their main objective or kind. There might be packages with mockups, wedding invitation templates and infographics, etc. On top of that, you will also find graphic packages particularly for Halloween, Christmas or St. Valentine’s Day. The advantages of graphic bundle deals for graphic designers are usually quite obvious. However if you are new to those elements and now have concerns, the subsequent information will probably be of great help for you. Including a large number of the elements within a single package, the selection gives you an opportunity to use different of them for various projects. On top of that, the price is typically greatly reduced which allows you to stretch your budget, yet receive the entire set valued for hundreds of dollars. Ways to spend less funds on MasterBundles.com items? Would you like a 5% additional price reduction on any package from MasterBundles.com? It’s not that hard. All you have to do is just share the web page with a package deal on social network (Facebook). When completed, the price reduction is going to be automatically added to your current shopping cart. Except for graphic design deals, you’ll find a massive variety of alternative design packages on MasterBundles. The package deals of stock photos, patterns, logo templates, icons, fonts and textures are out there at your disposal. On top of that, you may find the entire packages of WordPress design templates, courses and e-books, resume templates, presentations, and various other components. The watercolor graphics package deal is a package containing images and drawings painted with watercolors. They’ll flawlessly fit for a wide range of businesses, such as cosmetics, fashion, perfume and food distributors. Cards or themed wedding invitations may be made using this bundle. MasterBundles is a website that gathers best deals from the internet and allows you to buy the design elements you need in your business for a lower price. Packages this website offers are limited in time, and that is the reason they are so low-priced. MasterBundles boasts a big blog with the useful design news and features described. Should you be trying to find a website packed with great design products – MasterBundles.com is just for you!